We live in a rural bungalow with a beautiful conservatory to the front overlooking the garden and the countryside. 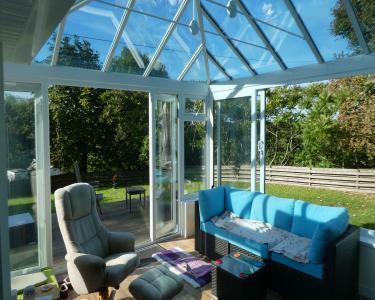 We also have another smaller conservatory/porch to the rear of the property. We have oil fired central heating, although the bungalow is so warm that we generally only need it from November to March! We have superfast broadband installed as we work from home. There is a jacuzzi bath in the main bathroom and a walk in shower in the shower room with a glass roof, so it's just like showering outdoors, under the stars! We have our own acreage and the pony can be seen from the kitchen window. We have plenty of parking too. Butch (Jack Russell) and the cats need feeding twice a day, and Butch needs at least one walk. If you wanted to take him out with you, he'd love that also. He does have access to the garden via the cat flaps so can be left at home without worry. The cats were feral so you probably won't see much of them, although Toffee will probably show up for his food, he's a bit of a greedy puss. Pipit is 33 years old and needs feeding twice a day but is generally given the run of the yard and stables so puts herself in and out of her stable when she wants.